Rarity and Value: These are very popular territorials. Some can be extremely rare and worth tens of thousands of dollars. Many more are available for a few thousand dollars each. The collector value really just depends on the condition and issuing bank. We have handled lots of notes like this and we would be happy to let you know what yours is worth. Don’t forget to check the serial number. Number 1 notes always sell for nice premiums. Current Market Analysis: We are surprised at how much the market for Washington national bank notes has softened since it peaked around 2006. It seems like the state has a lot to offer. First off, there are plenty of wealthy collectors living there. Geography really isn’t that important either, which is refreshing. The top 3% of the market is still very capable of being worth staggering amount of money, but it is the top 20% that we think should be worth more. You can challenge yourself by trying to collect just territorials, which would be quite difficult and expensive. Nice 1882 brown backs and 1902 red seals are scarce. There are even plenty of blue seal banks that are considered rare. 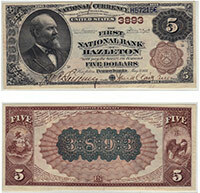 We buy all antique paper money issued by The Spokane National Bank of Spokane Falls, WA. We can tell you how much your $5 bill is worth. We aren’t just dealers. We are also collectors, experts, and appraisers. We have contributed to numerous price guides and are considered specialists in the field of national currency. Contact us via phone or email to get your free appraisal today.